When Jaani grins, her warmth is infectious and my face can’t help but mirror hers. She has five front teeth left now—“Old age has robbed the others,” she tells me very seriously, her eyes threatening to laugh again. Widowed three years ago, she lives with her son and daughter-in-law and their son, a little chap named, of all things, Shaitan Singh. I have to shout so that she can hear me properly. She falls into silence and I am not perturbed by this. I have often found that against the rural landscape, where time takes on another pace, numbers like age have a way of being forgotten. As if, in a place where time is measured by the passing of seasons and the position of the sun in the sky, remembering one’s age is hardly worthwhile. She finally decides to give me an answer, “Sixty or so.” I smile and dutifully note down the answer. My aide, a regular social worker in the area shouts at her affectionately, “Dukariya (old woman) you’ve got one leg in the grave and yet you say you’re only sixty! You must be at least eighty.” She looks back defiantly and I see sparks of the feisty thing she must have been in her youth. “Are you asking the questions or is she? Don’t interrupt us.” That silences him for a while and I carry on. 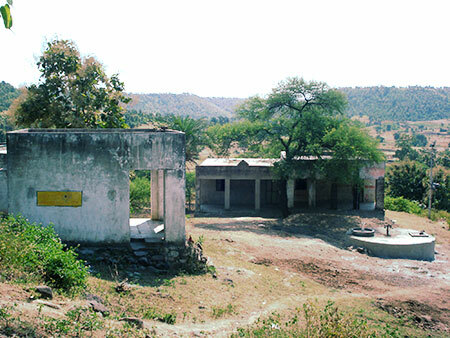 The deserted school. Photograph by Chandni Singh. Her eyes have mucous in them, the greenish-yellow residue has collected at the corners. She keeps swatting off a pesky fly that tries to sit on her face. I knew the Rs 1,000 per month that the scheme provided could be a handy addition to the household income. My aide whispered, “The postmaster is famous for pocketing some of the pension. But no one complains against him because they know nothing will happen.” I knew I was just scratching the surface of the canker of corruption that has invaded every system of my country. I turn to Shaitan Singh. “Class Two.” He says this in English. Suddenly, realising he is the focus of the conversation, he’s standing straight, in attention, his little hands clenched into fists by his sides, his wide, round eyes, attentive. His forehead is creased into a concentrated frown, this is serious business for him. I nod reluctantly, understanding the import of his words. The government-funded midday meal scheme provides one meal a day to schoolchildren and serves the double purpose of giving parents an incentive to send their children to school as well as fighting malnutrition by providing a nutritive meal to growing children. The scheme, though well-meaning, has been seen as another opportunity to siphon off funds and had a murky history of missing meals, sub-standard provisions, rice with more stones than grain and other such woeful tales. Here, however, Shaitan Singh alluded to the fact that the master was absent from the school when he pleased, and without anyone to distribute the food, the scheme was dysfunctional. It was the answer I knew and yet, I had been hoping to hear something different. For all the money being poured into various poor-oriented schemes, the mechanisms to deliver the benefits were as ill-equipped as earlier. The change we need is not in the amounts being spent but the channels it is flowing through. I think back to my conversation and Jaani’s nearly toothless grin. Her smile, reflected in Shaitan Singh’s round eyes. I had been asking about the new enikat (small dam) across the village stream and how the rain water collected in it had been used. Holding rain water for longer periods, the structure was particularly helpful during the lean summer months. It also checked the stream banks from eroding when the monsoons are particularly bountiful. Seeing I was hell bent on knowing all about the enikat, as I was leaving Shaitan Singh shouted out: “Didi! Dekho!” And with a brilliant display of showmanship, he jumped into the pooled water, his little limbs paddling furiously in the water. I laughed, and saw Jaani looking at his youthful mirth wistfully. I knew from my conversation that, like her pension, water in this land was unreliable. In a few months this pool would be dry. This is part of a series called ‘Village Vignettes’. As part of her Ph.D. in International Livelihoods at the University of Reading, U.K., Chandni Singh is trying to piece together the story of water availability in rural Rajasthan and what farmers are doing to adapt to their changing environment. The series is an ongoing compilation of her experiences as she traverses the district of Pratapgarh, in south Rajasthan, armed with her notebooks, kolhapuris, and water. Of course. By Roma Kunde · An unassuming little restaurant, Asian Wok offers up a mouthwatering variety of Thai, Chinese, and Malay dishes. In the meantime, please keep educating us!